A statement necklace is a great way to polish an outfit. 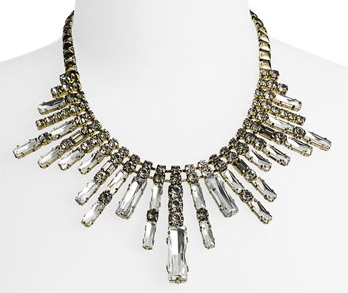 This crystal necklace will do just that and make you look like a million dollars. And at under $100, it is a fabulous find! Wear it with jeans and a T for an effortless air of style or with a dress for a sophisticated yet chic look. P.S. With the holidays not far off, it is the perfect glitzy holiday accessory!